Snakes, like all reptiles, are cold-blooded animals which cannot adjust their body temperature internally. The constant warmth and humidity of tropical rain forests provide an ideal habitat where snakes can live without having to shelter from heat or cold. Snakes of the rain forest are well adapted to an arboreal or tree-dwelling existence. Many have long thin bodies with angled scales on their bellies which help the snakes to grip branches. Other species have developed 'wings', enabling the snake to escape predators by gliding to another tree or the ground. Ground-dwelling snakes track by scent but in the trees the scent trail is broken whenever the prey crosses to another branch, so many tree-living species hunt by sight. Some have prehensile tails which can grip a branch firmly while the rest of the body moves on. Snakes are well camouflaged; the most common colours are green or brown to match leaves or bark, often with a twig-like or leaf-like pattern. Like the pythons of Africa and Asia the boas of South America kill by constriction. The largest boa is the anaconda, which averages 35ft in length and hunts along river banks. 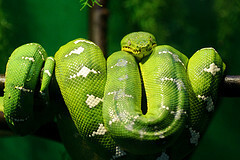 Other boas include the boa constrictor and the emerald tree boa. Pythons include many species of non-poisonous snakes which kill their prey, such as birds and small mammals, by constriction. The snake coils its long body round its victim and squeezes it to death. The largest python is the reticulated python of Asia; it can grow to 33 ft long and weigh 300 lb. The 3 ft long burrowing python of Africa is the smallest python. The snakes in this group have the two or three rearmost teeth of the upper jaw enlarged and grooved for injecting venom. Few species are very poisonous and only two, both African tree snakes, are dangerous to humans. The fangs of these snakes are fixed at the front of the upper jaw. This group includes many deadly species, such as the mambas of Africa, the cobras of Africa and Asia, and the coral snakes of the New World. These snakes have a large pair of poison fangs at the front of the upper jaw. The fangs lie flat when not needed and are raised when the snake strikes. The group consists of the vipers and pit-vipers, for example the rattlesnakes and the bushmaster snake of Central and South America.